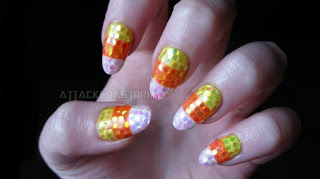 Attackedastoria Nails: Blinged out candy corn! Hey guys! I always do candy corn nails in October.. I love candy corn. I know this style of nail art is super popular, but I just loveeee it. I decided to make it a little different, and added some hexagon glitter in matching colors.. it looks wicked sparkly in real life! Love it. I love this soooo much! I pinned it on Pinterest. :) Great job!